One of the primary Neo-Impressionist members that included Georges Seurat Charles Angrand, Albert Dubois-Pillet, Camille Pissarro and Paul Signac, Henri-Edmond Cross, whose real birth name was Henri-Edmond-Joseph Delacroix, was born in Douai on May 20, 1856. He was a Neo-Impressionist master and was an important figure in the development of the second phase of this art movement. He exerted a high degree of influence on Henri Matisse and other artists and was also influential in the growth of Fauvism. Henri-Edmond Cross was one of the most underrated artists among the modern artists. He was a friend and contemporary of Paul Signac but he was not a popular as Signac. The two artists were doing work that were almost of the same quality between 1890 and 1900. The difference in popularity was due to several factors. Signac had children who supported and promoted his works while Cross did not have children and his paintings were in various places. He died at the age of 54, which meant that this career was short. Likewise, he championed pointillism, which was very time-consuming. A painting could take weeks or several months to finish. 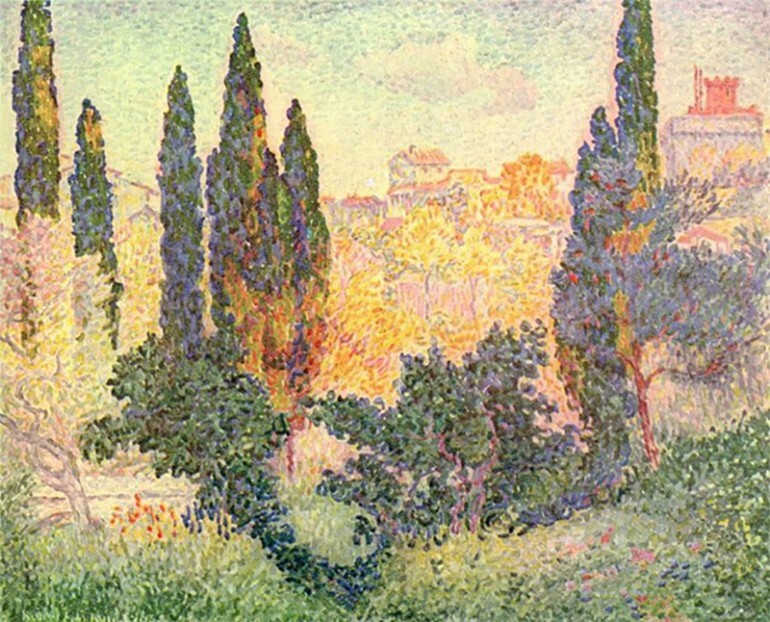 He was little studied as well, although he was Paul Signac’s friend albeit his reputation and his work were constantly developed due to his friendships with several artists. It was his uncle, Dr. Auguste Soins, who recognized his talent as a young lad, and he financed the art training of Cross. He started his lessons in 1866 when he was 10 years old. He was a student of Carolus-Duran, who was also the teacher of several artists including Theodore Robinson and John Singer Sargent. When they moved to Lille, he took lessons in the art and architecture schools before he attended the studio of Francois Bonvin. He visited museums in Lille to copy the drawings of masters such as Eugene Delacroix, Camille Corot, Anthony Van Dyck and Rubens. His move to Paris in 1878 was during the time when Impressionism has reached its zenith and joined the studio of Emile Dupont-Zipcy. He joined the Salon des Artistes Francois in 1880. This was the time that he met and formed lasting friendships with Paul Signac, Georges Seurat, Albert Dubois-Pillet and Charles Angrand. They shared experiments in their work and soon formed a new movement, Neo-Impressionism. Many of his initial works did not survive. Four years later, Cross was one of the founders of the Salon des Independants, in which he would exhibit his works annually throughout his life. The last major exhibition of Impressionist works in Paris was in 1886 when Georges Seurat exhibited his oeuvre “Sunday Afternoon on Island of La Grande Jatte.” Cross at that time was already active in the theoretical discussions about contrasting tones, principles of optical mixture and division of colors. In 1891, Cross was the vice-chairman of the group in-charge of the Salon des Independents, and he exhibited his first work with divisionist technique. He later became an official member of the Neo-Impressionist group when Georges Seurat died in 1891. Art critic Andre Mellerio said that Cross was the most formally pointillist artist of all. By this time he was suffering from rheumatism and moved to Saint-Clair. He still continued to paint, joined exhibitions and remained in touch with his friends. The neighborhood of Saint-Clair provided him with inspiration and he created canvases filled with small, circular and regularly-spaced dots in lighter tones, with his favored colors like yellow, orange, pink and white covering the canvas. His contact with other artists including Fauvism leader Henri Matisse and his trips to other places including Venice opened his eyes to new styles and sights, broadening his repertoire. He experimented with other styles late in his career and abandoned pointillism, creating several sketches and quite a number of watercolor paintings. 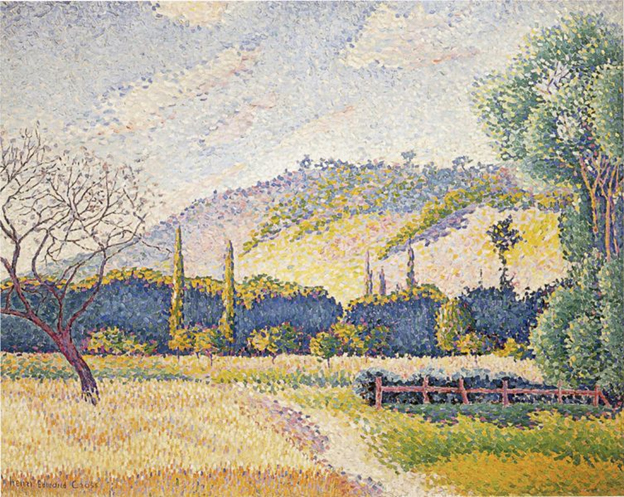 Henri-Edmond Cross passed away at the age of 54 on May 1910.